Newsworthy: Ford Motor Co. outlined the next phase of its expansion in China yesterday, with 50 new Ford and Lincoln models going to that market by 2025. 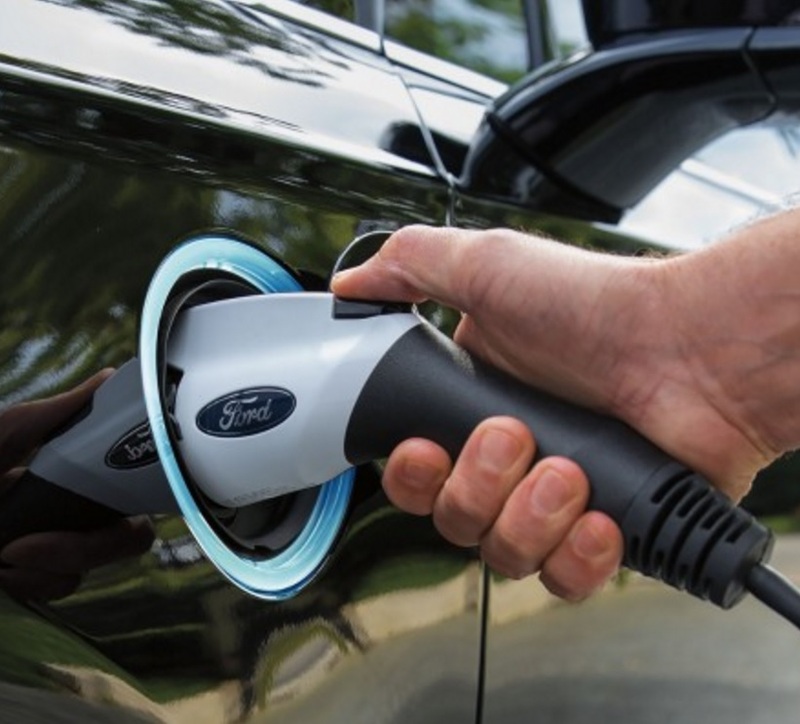 There will be at last 15 new electric vehicles under these brands, and the separate Zotye-Ford joint venture will offer a range of affordable all-electric vehicles under a new brand. 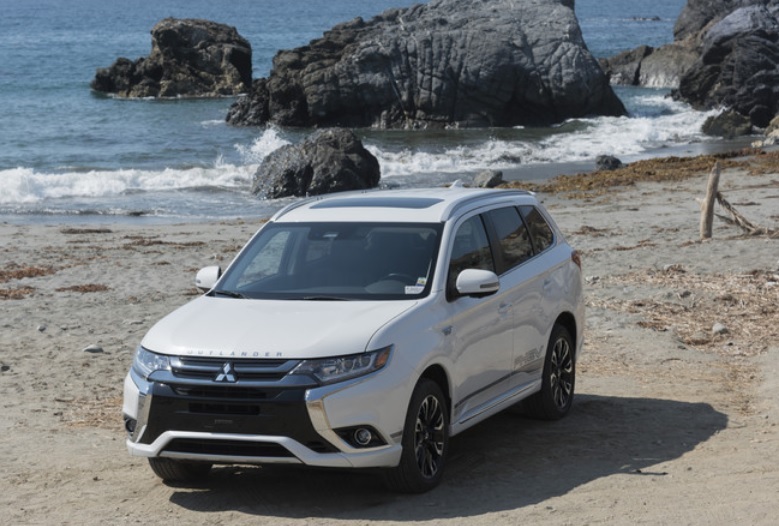 Sport utility vehicles will be emphasized, with eight new utility vehicles being rolled out under the 50-vehicle launch. Connectivity will play a greater role, with all Ford and Lincoln vehicles in China connected through either embedded modems or plug-in devices by the end of 2019. As for autonomous vehicles, Ford will tap into its board member presence of Chinese company Baidu’s Project Apollo. The Apollo Open Platform will facilitate the development, testing, and deployment of autonomous vehicles, the company said………… Electric bus manufacturer Proterra announced yesterday that Yosemite National Park will add two Proterra Catalyst buses to its fleet. It will be the first U.S. National Park to permanently add zero-emission buses to its shuttle fleet, offering its visitors a modern, ecologically-friendly transportation option, Proterra said. Beginning service in late 2018, the Catalyst buses are expected annually to reduce 887,000 lbs. of greenhouse gas emissions and save approximately $150,500 on maintenance and operating costs for the national park………… Volkswagen AG’s Moia mobility service division yesterday unveiled a six-seater, all-electric minibus that will be deployed in Hamburg during the second half of 2018. The EV will be rolling out globally after the launch, Ole Harms, chief executive of the division, said on Monday at the TechCrunch Disrupt conference in Berlin. Harms expects services using Moia minibuses to replace 1 million cars across European and U.S. cities by 2025. It will start with 200 units and will scale up to about 1,000 in the following years; drivers of the electric minibus will be offered by Moia, as well as the service being offered to fleet operators and municipalities, he said. * 2018 targets require fuel companies to blend 19.29 billion gallons of renewable fuels into the nation’s gasoline and diesel supply, up slightly from the 19.28 billion gallons required for 2017. That breaks down to 15 billion gallons of conventional biofuels like corn-based ethanol, in line with 2017, and 4.29 billion gallons of advanced biofuels, up from 4.28 billion in 2017. For 2019, the agency set a target for biodiesel at 2.1 billion gallons, unchanged from 2018. * “Maintaining the renewable fuel standard at current levels ensures stability in the marketplace and follows through with my commitment to … upholding the rule of law,” EPA Administrator Scott Pruitt said in a press release. Biofuels groups such as Renewal Fuels Association praised the decision. * National Biodiesel Board and U.S. Senator Chuck Grassley of Iowa were disappointed to see an increase in biodiesel levels not included in the new rule. * Clean Energy Fuels was pleased to see that renewable natural gas was included as an advanced renewable fuel. “Last week the U.S. Environmental Protection Agency (EPA) upheld its commitment to the Renewable Fuel Standard, and particularly renewable natural gas (RNG), thereby giving the market a clear sign of confidence which will result in its continued growth. This action sent a very positive message to those who produce, sell and consume RNG,” said Clean Energy Fuels President and CEO Andrew Littlefair. A few years ago, algae biofuels and oils looked like ideal options for the future of clean transportation. For those objecting to corn-based ethanol, or concerned about traditional biodiesel, algae fuel was showing a lot promise for passenger cars and commercial vehicles. Appealing factors have included emission reductions and the ability to tap into the renewable fuels and oils through plants. Algae are photosynthetic organisms related to plants that grow in water and produce energy from carbon dioxide and sunlight. For transportation fuels, they’re primarily used as biodiesel, but have other applications for cars, jets, and military vehicles. Algae can be grown rapidly and produce large amounts of fuel relative to the resources used to grow them – but it does need significant investment and supporters who will continue to back it over several years. Lately, the future of algae biofuels has become open to debate and may stand a better chance of succeeding in other markets beyond automotive and transportation. However, algae fuel still has several deep-pocket investors and industry groups supporting it as a clean fuel option. One of the surprises happened earlier this year with Solazyme renaming itself TerraVia, which will no longer focus on its fuels and industrial businesses. The new corporate identity means that it will supply its algae oil to the food and personal care industries for use in products like cooking oil, protein powders, and face lotion. Based in South San Francisco, Solazyme had been a staunch advocate of algae biodiesel for years. The company did split off a separate unit called Solazyme Industrials, offering its Soladiesel product, Solajet, and military-grade fuel; but the original company’s focus appears to be weighted on TerraVia. Last year, Volkswagen of America had successful completion of its Renewable Diesel Evaluation Program in collaboration with Solazyme and Amyris, Inc., another algae fuel supplier. Beginning in 2012, Volkswagen measured the environmental impacts from the use of pre-commercial renewable diesel formulas in a 2012 Passat TDI, and found that it was producing significantly less in emissions than traditional diesel. VW displayed this car, fueled with Solzyme’s Soladiesel product, at ride and drive events around the country. VW still shows support for algae fuels as part of its clean fuels strategy in the post-diesel emissions fraud reporting scandal, along with its ambitious plug-in electric vehicle launch lineup. Soladiesel was impressive enough to earn a fuel pump and marketing campaign with Propel Fuels. In California during 2013, Propel Fuels and Solazyme announced that sales grew by 35% at Propel stations, offering SoladieselBD in a B20 blend during a 30-day retail pilot program, compared to non-test sites. Amyris, one of the two biofuels supporters of VW’s test project, applies its bioscience solutions to convert plant sugars into hydrocarbon molecules, specialty ingredients, and consumer products. On the transportation fuel side, the company is currently selling renewable diesel in metropolitan areas in Brazil and renewable jet fuel with its partner Total in markets around the world. Another major biofuels company that still supports algae as a transportation fuel is Algenol Biotech. Last year, Algenol entered an agreement with Protec Fuel Management to market and distribute a new type of ethanol from Algenol’s Fort Myers, Fla., commercial demonstration module. The companies say it’s the first time that ethanol made from algae will be available commercially. 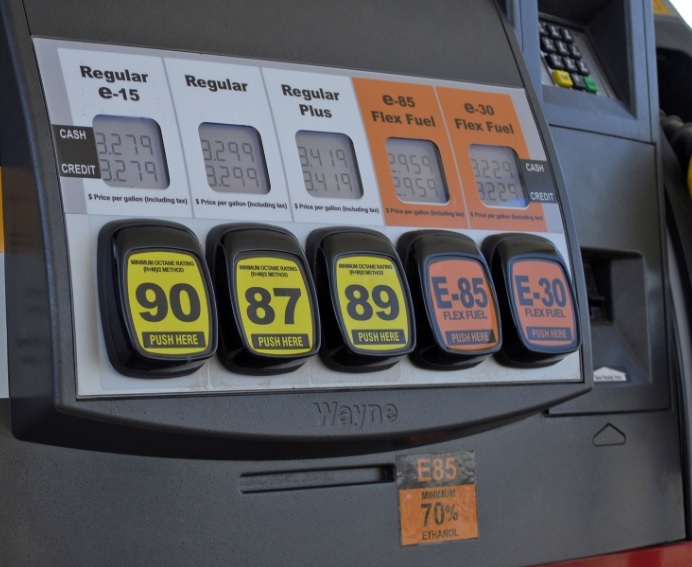 Protec Fuel will distribute and market the fuel for E15 and E85 applications for both retail stations and general public consumption, as well as fleet applications. The partner companies will also offer Algenol’s future 18 million gallons per year from its commercial plant, which is planned for development in Central Florida this year and in 2017. Algenol has been developing its Direct to Ethanol technology, which uses sunlight, algae, non-arable land and carbon dioxide to economically produce ethanol. Of particular interest to the company are those chemicals traditionally derived from petroleum-based propylene. As with ethanol, production of these chemicals using Algenol’s proprietary technologies could displace more expensive petroleum based chemicals in an environmentally friendly way, the company says. Denso Corp., a major supplier of fuel injectors, air conditioners and electronics to Toyota and other OEMs, announced last fall that it’s getting into the algae biofuels space. The company was scheduled to open a cultivation and testing center in April 2016 in Japan that will have three oval ponds for growing algae. The company has been working on microalgae test projects since 2008, and sees the biofuel as an excellent option to reduce dependence on petroleum products and carbon emissions. 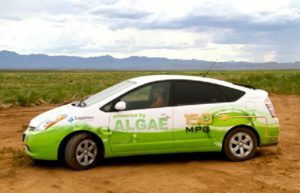 Algae biofuel falls under California’s Low Carbon Fuel Standard requirements, and had three backers on the list of supporters released last week – Algae Biomass Association, Advanced Biofuels Association, and Global Algae Innovations. Based in San Diego, Global Algae Innovations is considered to be a leading supplier of low-cost algae production technologies. These three entities were among 57 fuel producers and trade associations who wrote to California Senate President Pro Tem De León and Speaker Rendon, urging support for the California Low Carbon Fuel Standard. On the federal front, algae is still receiving support. On July 14, the U.S. Department of Energy announced funding for up to $15 million for three projects aimed at reducing the production costs of algae-based biofuels and bioproducts through improvements in algal biomass yields. The goal of the funding is to advance the research and development of advanced biofuel technologies to speed the commercialization of renewable, domestically produced, and affordable fossil-fuel replacements. Algae fuel has been included in the revised and finalized volumes for the federal Renewable Fuel Standard. One change made to the revised RFS was to clarify that only biofuels produced from oil from algae grown photosynthetically qualify for the RFS program under the algal oil pathways. Two companies have been approved by the U.S. Environmental Protection Agency as completing pathways assessments: previously mentioned Algenol Biofuels and Bedford-Mass.-based Joule Unlimited Technologies, Inc. The companies are being allowed to generate D5 advanced biofuels renewable identification numbers (RINs) for their algae-based ethanol under the RFS. Microalgae is less land-intensive than corn production and less thirsty than corn ethanol; as revealed in a pro-corn ethanol study showing corn ethanol uses 2.8 gallons of water for every gallon of fuel refined, and is outclassed in efficiency by algae-based fuels. For example, Algenol converts saltwater into biofuel with yields nearly 17 times higher than those of corn, while producing 1.4 gallons of fresh water per every gallon of fuel produced. Dual-fuel vehicles and plug-in hybrids using algae fuel could be a good way to go for consumers and fleets. For example, what if you were to drive a bi-fuel CNG Chevrolet Impala that was also built on the Voltec plug-in hybrid drivetrain (if GM were to roll out that vehicle in the future)? That would offer the driver an opportunity to power the car on natural gas (which emits about 25% less greenhouse gas than a gasoline-engine vehicle), battery power (zero percent emissions). That might be ideal for fleets that worry about having drivers stuck out on roads. In the next few years, there will be a lot more clean fuels out there, including algae biofuel, along with cellulosic ethanol, dimethyl ether (DME), biogas (renewable natural gas), biodiesel, and renewable diesel. In the past decade, vast amounts of money have been invested in the development of algae for biofuel production. Shell and ExxonMobil were investors, seeing algae biofuel as a pipeline for moving forward in a non-petroleum product. But these oil giants and several other major companies have been abandoning their investments lately. Algae biofuels producers, in many cases, haven’t provided good return on investment for corporate backers. Producers struggled to retain their high productivity at a larger scale and found predators often contaminated their farms. They also found that building the ponds in which to grow the algae and providing enough light and nutrients for them to grow proved too expensive. Another cause of the algae downturn has been plummeting oil prices. As mentioned about the Solazyme corporate identity changeover, algae can be used to make a diverse range of products. For example, algae can produce large amounts of omega-3 fatty acids, an important dietary supplement. This means it could be a sustainable, vegetarian source of omega-3, which is otherwise only available from fish. Algae is being used more as a sources of vitamins, minerals and proteins. Species found in algae, such as Chlorella and Spirulina, are commonly being consumed for their health benefits. In February, researchers at the National Renewable Energy Laboratory reported a breakthrough system that ramps up the efficiency of the algae-to-ethanol process to a significant degree. The new algae biofuel process builds on NREL’s previous work with two algae strains, Chlorella and Scenedesmus. The challenge has been getting it up to commercially competitive scale. The conventional approach leans heavily on increasing the lipids content of algae. NREL has been focusing on a whole-body system that extracts lipids, carbohydrates, and proteins for further processing into marketable products. 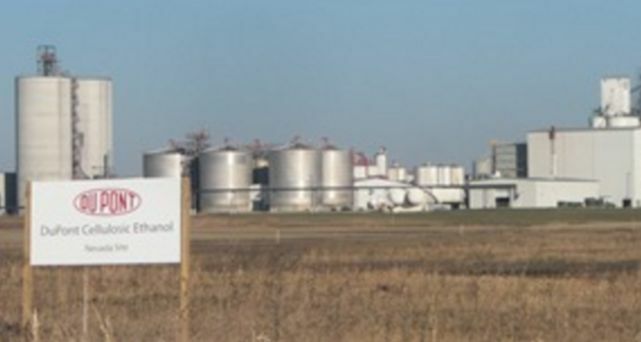 The DuPont cellulosic ethanol plant that opened in Nevada, Iowa, on October 30, will be the largest cellulosic ethanol plant in the world. 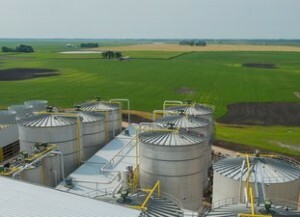 The facility is expected to produce about 30 million gallons of cellulosic ethanol per year from corncobs, husks and stalks that are harvested within a 30-mile radius of the site. Most of this fuel will be shipped to California. For the near-term future, DuPont plans to sell most of that fuel in California to help the state meet its low-carbon fuel standard (LCFS). California’s LCFS, along with its quarterly carbon credit cap-and-trade auctions and the resulting Greenhouse Gas Reduction Fund, has become a significant source in government funding for advanced biofuels, renewable natural gas, and renewable diesel. The U.S. Environmental Protection Agency in its May ruling changed course on blended biofuels, which adds ethanol to gasoline and biodiesel into diesel, showing less support for E10 or higher. The EPA is still supporting growth in advanced biofuels, but acknowledged that the volumes are lower than what was originally set by Congress. The proposed rules are set to become final by late November. (And a Moore Information survey conducted on behalf of the National Biodiesel Board found 80% of U.S. registered voters support a national renewable fuel standard to increase biodiesel use in the U.S.) For now, California’s LCFS and available funding is providing more potential for gaining investment and support in clean fuel projects. If you view the state’s Greenhouse Gas Reduction Fund that’s administered by the California Air Resources Board, you’ll notice that public transit, with rail and bus systems, has been getting most of the funding so far. The Low Carbon Transportation Fund shows much potential for fleets, transportation companies, and infrastructure builders. There’s $230 million in available funds for zero and near-zero emission passenger vehicle rebates; heavy duty hybrid/ZEV trucks and buses; freight demonstration projects; and pilot programs (car sharing, financing, etc.) in disadvantaged communities. Much of California’s recent funding programs are influenced by Senate Bill 535, passed in 2012, directing that a quarter of the proceeds from the Greenhouse Gas Reduction Fund must also go to projects that provide a benefit to disadvantaged communities. Clean Energy Renewable Fuels, a division of Clean Energy Fuels Corp., has been gaining interest among fleets for its Redeem brand renewable natural gas. Last year, Harrison Clay, president of Clean Energy Renewable Fuels, said that there had been about $10 million in LCFS credits sold for biomethane on the state’s cap-and-trade market. The City of Oakland, Calif., has taken a similar strategy as DuPont supporting LCFS with its decision to utilize renewable diesel in its fleet. Last month, the first of its fleet vehicles filled up with NEXDIESEL renewable diesel during a gathering of the Public Works Department, its supplier Golden Gate Petroleum, and fuel manufacturer Neste. 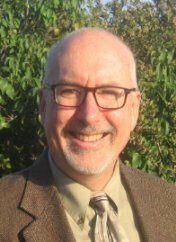 Oakland will be running about 250 on-road diesel vehicles and 100 off-road vehicles on renewable diesel, according to Richard Battersby, Equipment Services Manager for the City of Oakland. Battersby said that subsidies and support related to California’s low carbon fuel standard offset the higher cost of producing the renewable fuel. Iowa has been gradually moving away from corn ethanol. It’s the nation’s largest producer of ethanol, and it has become a hotbed for cellulosic ethanol development. In September 2014, POET-DSM Advanced Biofuels, LLC, a joint venture between Royal DSM and POET, LLC, hosted the grand opening of “Project LIBERTY.” The plant converts baled corn cobs, leaves, husk, and stalk into renewable fuel at the cellulosic ethanol facility in Emmetsburg, Iowa. Another company, Quad County Corn Processors, began using a different technology that takes out the corn fiber from corn-ethanol production to make cellulosic ethanol. Preparation for the building of this advanced biorefinery started in the early 2000s when it began working with DOE’s National Renewable Energy Laboratory on biofuels technology. According to DuPont, the biorefinery has provided many job and financial opportunities for this rural area of the United States. DOE has supported DuPont by funding key bioenergy conversion technologies and collaborating on research and development projects. In total, DOE has contributed more than $51 million dollars to advance various technologies that helped bring DuPont’s new biorefinery to market. Times continue to be unstable – and very interesting – for biofuels as an alternative transportation fuel. Corn ethanol producers are not happy with what the US Environmental Protection Agency is recommending for the Renewable Fuel Standard (RFS) volume requirements, and battles continue over whether E15 (15% ethanol blended into gasoline) should be allowed – or even if any ethanol blends should be allowed to continue. Advanced biofuels have hopeful signs, including 36 U.S. senators petitioning to have its volume increased in RFS. Biodiesel, like other advanced biofuels, have gone through quite a lot of instability in the past year over investor support and market demand for the fuels. The Biofuels Digest Index, an index of publicly traded biofuels stocks, just dropped 2.13% to a 6-year low of 58.91 as advanced biofuels tumbled sharply. With all being considered, aviation biofuel is raising hopes for more adoption of the alternative fuel in transportation sectors. Colorado-based Red Rock Biofuels has brought in another major client, this time FedEx Express, a subsidiary of FedEx Corp. That company will produce about three million gallons of renewable jet fuel per year from 2017 through 2014 for FedEx Express. The announcement comes less than a year after Red Rock made an agreement with Southwest Airlines. That airline will procure another three million gallons of woody biomass-based fuel annually. Many people were inspired earlier this year by Solar Impulse successfully completing a five-day crossing of the Pacific from Japan to Hawaii. That was the first phase of its historic attempt to be the first solar-powered airplane to fly around the world. 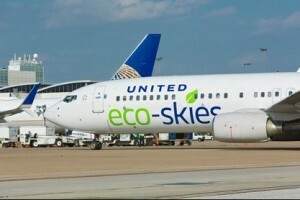 So far, biofuels is the alternative fuel that holds the most promise for commercial aviation. Other major airlines – including United Airlines, British Airways, and Virgin Atlantic – are testing out their own biojet blends to hit financial and environmental targets. United Airlines recently announced buying a $30 million stake in Fulcrum Bioenergy, the biggest investment yet by a U.S. airline in alternative fuels. Fulcrum plans to build facilities that turn household trash into diesel and jet fuel. Volume is growing fast enough for Red Rock Biofuels to open its first commercial plant, which is scheduled to break ground this fall in Lakeview, Ore. That plant is expected to produce 15 million gallons of fuel per year of woody biomass converted into renewable jet, diesel, and naphtha fuels. Aviation executives are carefully watching a few trends in the market scalability of biofuel supply chains, regional variation in available feedstocks, and cost concerns. “We as an industry need to increase the supply, and we need to bring down the cost. It needs to be more affordable and available,” Jessica Kowal, Boeing’s head of environmental policy communications, told GreenBiz. Red Rock Biofuels Co-Founder and President Terry Kulesa, sees two major forces driving growth in aviation biofuels – volatility in oil prices and more nations tightening up their carbon regulations. Industry observers are seeing renewed interest in biofuels from Boeing, U.S. Dept. of Defense, FedEx, Southwest, and other airplane manufacturers and commercial airlines. The US Environmental Protection Agency released its long-delayed Renewable Fuel Standard proposals for 2014, 2015, and 2016 on Friday. The EPA is proposing requiring 15.93 billion gallons of total renewable fuel in 2014, 16.3 billion gallons in 2015, and 17.4 billion gallons in 2016; the federal agency said the 2016 proposal is nearly 9% more — or 1.5 billion gallons — than actual 2014 volumes. The proposal is still well below the level originally mandated by Congress in the 2007 Energy Independence and Security Act – 20.5 billion gallons in 2015 and 22.25 billion gallons in 2016. The proposed rules are set to become final by late November. Most gasoline sold at US fuel stations contains 10% ethanol. For more ethanol to be blended in, a greater amount of fuel would need to contain gasoline with 15%, or 85% in flex-fuel vehicles. While attracting significant biofuels industry criticism on volumes, the EPA won some cautious praise for cautiously advancing renewable fuels targets for 2014 through 2016. It wasn’t right with the American Fuel and Petrochemical Manufacturers, which thinks the rule still has the EPA forcing more ethanol than the marketplace can handle. 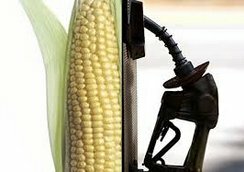 That blend wall debate dates back to the 2005 Renewable Fuel Standard that required the blending of corn-based ethanol and other biofuels into motor fuels; it was to eventually reach 36 billion gallons in motor fuel by 2022. Based on energy independence and reducing greenhouse gas emissions, efforts by the EPA to raise the blend beyond 10% of gasoline coming from ethanol have been met with legal battles, intense lobbying, and public comment town meetings packed with supporters and opponents. Along with oil companies and refiners, automakers have backed limiting the ethanol blend with concern over potential damage to engines. Several automakers said that using E15, or anything over E10, would void their warranty coverage. For fleets, transportation companies, and individuals based in Northern California driving diesel-engine vehicles, there’s now a renewable diesel available at fuel stations for about the same price as traditional diesel. California Air Resources Board (CARB) studies show that this renewable diesel can reduce greenhouse gas emissions up to 70% compared to petroleum diesel; and offers significant reduction in nitrogen oxide (NOx) and particulate matter for those concerned about air quality and health issues in regions with high output from commercial trucks. Propel Fuels has brought this renewable fuel, called Diesel HPR (High Performance Renewable), to 18 fuel stations in Sacramento, San Jose, East Bay, Redwood City, and Fresno. Diesel HPR was created by Finland-based Neste Oil using that company’s NEXBTL renewable diesel. Diesel HPR is a low-carbon renewable fuel designated as ASTM D-975, the standard for ultra-low sulfur diesel fuel in the US. It’s also recognized as “CARB diesel” by the state agency, and is a certified fuel with the US Environmental Protection Agency. 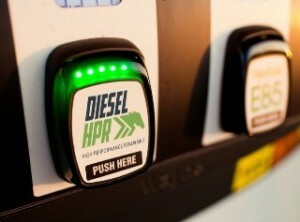 A complete list of Diesel HPR fueling locations is available at dieselhpr.com/locations. Elam says there’s been tremendous interest in the fuel from owners of diesel-powered cars with Bosch technologies (such as Volkswagen, Audi, and Mercedes-Benz diesel-engine models) that have “No Biodiesel” stickers. Using biodiesel would threaten their warranties. “They’re excited to see Diesel HPR launched,” Elam said. The fuel’s high-blend rate with reduced greenhouse gas emissions has made it very appealing to corporate and government fleets, he said. “Many fleets are moving towards the state’s Low Carbon Fuel Standard, so low carbon diesel makes sense,” Elam said. Bakeries with a fleet of Sprinters are very interested in the fuel, as are companies in the heavy-duty long-haul trucking business. While the EPA is still mulling over 2014 production volumes under the Renewable Fuel Standard and its RIN credits, California’s Low Carbon Fuel Standard and cap-and-trade credit market makes the state an appealing place to launch renewable transportation fuels. Clean Energy Fuels would attest to that through its Redeem renewable natural gas; that product is finding interest by fleets wanting to comply with California standards and utilize clean fuels to meet emissions targets. The Renewable Fuel Standard and RIN debate has been a major concern to the biofuels industry. There has been enough interest in renewable fuels for Neste to bring a large volume of its fuel to California, Elam said. This is the first time renewable diesel is being offered as its own product; it has cost parity with regular diesel in California but its weights and measures are still being worked out by the agencies, he said. “This renewable diesel joins a growing suite of new, cleaner transportation fuels in California thanks to our Low Carbon Fuel Standard and forward thinking companies like Propel,” said California Air Resources Board Chairman Mary Nichols, in the press release. Propel Fuels started up in 2004 when it set up the very first public biodiesel station in Seattle. Passage of AB 32 in California motivated the company to bring renewable diesel, ethanol, and biodiesel to fuel stations across California. Oregon has passed a low-carbon fuel standard and the state of Washington is considering one. The company will expand into others states as market demand grows, but as for now, there’s “plenty of growth in California,” Elam said. As you review this table with 2014 Renewable Identification Number (RIN) production data, you’ll notice a diversity of biofuels starting to enter the market. The US Environmental Protection Agency released this data last month to track whether production goals set in the Renewable Fuel Standard were met. It’s no longer all about ethanol, with biodiesel seeing growth and cellulosic starting a new phase. Cellulosic biofuel (such as cellulosic ethanol) nearly doubled that number with over 32 million gallons generated and biomass-derived diesel (such as biodiesel) surpassed the mandate by nearly 471 million gallons. Advanced biofuels (biodiesel and renewable diesel) were behind the mark. Corn ethanol fell behind by about a billion gallons, but it’s the biofuel category making up the lion’s share of the total reaching over 14.2 billion gallons in production last year. Without being lifted to the E15 level (15% of gasoline instead of the current E10 level) by the EPA, its volume has been lower than the original benchmark set in the mandate. RIN volumes and prices are followed closely by biofuel producers and oil companies. 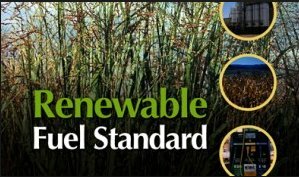 Under the Renewable Fuel Standard, oil companies can either buy a gallon of renewable fuel to comply with the RFS or buy a RIN credit on the open market. It’s been one of the targets of complaints by oil companies and oil refineries. Ethanol is used as the baseline for calculating RINs, with one RIN equaling one gallon of ethanol. 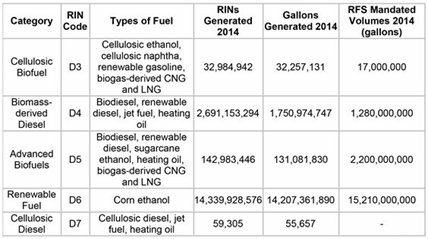 Biodiesel accounts for 1.5 RINs per gallon, and other categories have their own RIN ratios. RINs are given monetary value on the market as an incentive for renewable fuel production and the EPA uses RINs to monitor biofuel trading and production volumes. Lux Research, which featured that table above in a report issued on Sunday, made the point that cellulosic biofuel has entered a new phase. For the first time since adoption of that category in 2010, the mandated volume was met by the commercialization of cellulosic ethanol. However, Lux Research warns investors and analysts to not overrate the performance of that segment. RIN data from December 2014 showed that only 89,327 gallons of cellulosic ethanol were generated; that signifies a much slower ramp up of the POET-DSM’s Abengoa facility that received much attention and acclaim when in started up operations in September. The biofuel industry has seen its share of commercial facilities open up and miss their targets with low production volumes. Are you producing and selling an alternative fuel that’s getting tangled up in regulatory limitations? No worries – just sell it overseas. While ethanol and other biofuels producers have been frustrated with delays in the Renewable Fuel Standard decision by the US Environmental Protection Agency (EPA), exports of corn ethanol have increased 31% this year and have reached their highest level since 2011. Ethanol used in gasoline will probably never hit the 15% ethanol E15 target that the EPA had been considering; and the 10% ethanol mark may be reduced by pressure being placed on the EPA by oil refineries and producers. Exporting petroleum products with the additive ethanol blend has been a big growth sector for petroleum products and ethanol in the past few years. The US passed Russia in 2010 to become the dominant exporter of petroleum products, and ethanol sales have increased with that growing overseas demand. Exporting fuel has been a bit more difficult for liquefied natural gas (LNG). So far, the US Dept. of Energy (DOE) has approved each export application, but the approval process has been complicated. Some analysts worry that strong demand for US-drilled natural gas may drive up the price for LNG and compressed natural gas, but so far it remains stable for users of natural gas vehicles. The shale-oil boom in the US has created a stream of oil and gas products being sold overseas; ethanol is seeing a record level of crops being grown for these exports. The US is now producing about 66 million metric tons more corn than 10 years ago; that’s nearly as much as the rest of the world will export this year. Overseas demand is keeping ethanol sales strong even though the EPA has been easing off the ethanol mandate for the past year. Ethanol trade lobbyists have traveled to Peru, Panama, Japan, and South Korea and trips are planned to Thailand, Malaysia and the Philippines this month to gain support for more overseas ethanol sales, according to RFA. A Commerce Department-sponsored trade mission to northern Brazil last year won sales contracts valued at $29 million, the RFA says. If the EPA mandates a lower volume of ethanol sales in US fuel, it probably won’t matter much for the ethanol industry. The US Environmental Protection Agency decided to once again put off its decision on biofuel production and gasoline blending until next year – nearly one year after deciding to extend that decision on production volume. A deadline wasn’t given, but it’s probably not going to be announced anytime soon. While government regulations aren’t the only market force determining what happens to a business sector, it appears that the EPA decision on production volume mandates will shape the future of biofuels. That industry, and oil producers and refiners, have placed a massive amount of energy and resources on influencing the federal agency. Reactions to the latest EPA decision have been mixed. The EPA’s announcement on Friday came after it was nearly a year late in issuing its 2014 requirements for the production and use of ethanol, biodiesel, and cellulosic fuels. Oil refiners and producers had been arguing and lobbying hard over how much renewable fuel could be blended into the gasoline supply; and they say that the Renewable Identification Numbers (RIN) credit market system is volatile and costing them way too much money. Automakers have been sending out warnings on the corrosive effect that E15 could bring to engines. Biofuel farmers and producers have been fighting for victory on RFS for increasing the gasoline blend to E-15 and for supporting advanced biofuels, particularly cellulosic ethanol and biodiesel. The EPA held public hearings around the country over the past year where thousands of people made their case for or against the RFS. The EPA has sent out mixed messages. EPA Administrator Gina McCarthy may agree with automotive engineers sending out warnings that too much ethanol in gasoline will damage vehicle engines. McCarthy has also suggested that the EPA is leaning toward increasing biofuel production in the 2014 rules and beyond. That could be a reference to backing off corn ethanol (such as leaving it at E10) and increasing volumes of advanced biofuels such as biodiesel, cellulosic ethanol, and other fuels coming from algae and biomass. National Biodiesel Board is very frustrated with the delay and sees it undermining the biodiesel industry. While it acknowledges that the decision is complex, it makes no sense that the decision on how volume should be produced has been delayed again. Biodiesel producers have laid off workers, idled production, and some have shut down completely, says Anne Steckel, VP of federal affairs at National Biodiesel Board. BIO President and CEO Jim Greenwood appreciated the delay in finalizing the proposal with what he considers to be flawed methodology for setting renewable fuel volumes. He’s concerned to see that the delay in the EPA decision has chilled investment and financing of future cellulosic biofuel plants. Advanced Ethanol Council, Renewable Fuels Association, and Growth Energy are tired of seeing it being dragged out but are confident that the EPA understands it was wrong about its original ruling. The influence of “Big Oil” has been extreme, and the EPA will likely be issuing standards more supportive of biofuels, the groups say. The American Fuel & Petrochemical Manufacturers (AFPM), speaking for the oil industry, wasn’t too happy about it. “Today’s announcement indicates that the Administration plans to continuously mismanage this program in a manner that equates to playing Russian roulette with the nation’s fuel supply at the American consumer’s ultimate expense,” said Charles Drevna, the association’s president. The AFPM filed a notice of its intent to sue the EPA over its failure to issue the 2014 RFS regulations. The Environmental Working Group thinks that the corn ethanol blend in gasoline needs to be reduced and that Congress should reform what it calls “our badly broken food-to-fuel policies.” The group thinks that corn ethanol needs to go away and truly “green” biofuels need to be adopted for reducing greenhouse gas emissions.